also i was on a press trip in turkey for a week! filing from the road was difficult, as the turkish wifi access i attempted to purchase at the airport in istanbul proved wildly unreliable, and even the best wifi falters when, say, one is attempting to report from a cave. 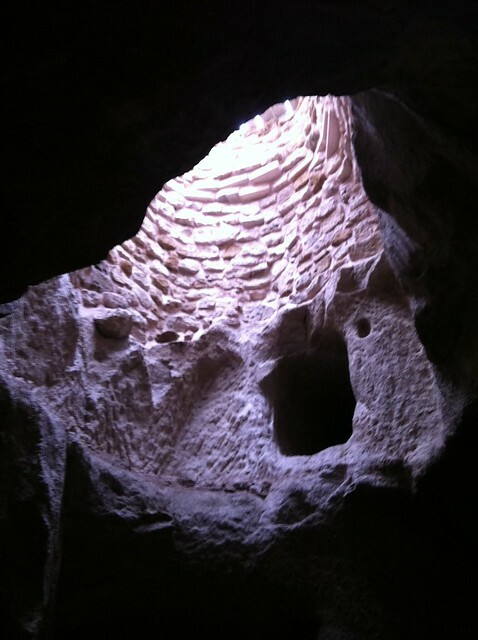 this is not that cave (which was far and away the finest of the trip's accommodations; in all seriousness, i wish to move to a turkish cave hotel), but a shaft of light from the surface at derinkuyu, an underground city in cappadocia. full-time freelance writing is a bit like cave-dwelling, as it happens! there is ample opportunity to nap and take intense bubble baths, but the isolation can be a bit daunting and the ceiling discharges tiny rocks every now and again. Ah. May the tiny rocks always be Pop. one of my favorite journalists on the trip plopped down beside me on the coach one morning and asked, "have you ever snorted fizzy candy?" Also: I thoroughly enjoyed the Turkish cats you posted on IG. I wondered if this was a work trip - freelance trip to Turkey? Sounds amazing. i told her that as a matter of fact, i had. thanks re: the cats! i think i have a million more of them on my real camera, which has 600+ yet-to-be-uploaded shots on it; one of these days i need to brew a huge cup of coffee and figure out what else is on there. in other news, a friends saw this photo on facebook and thought it was a sonogram, which is amazing. i contain (no) multitudes! It is sonagram-y! But I wasn't fooled, even though sonagrams seem to be the rule rather than the exception lately. I always figured the naps would be the best part of freelance work. Please report back from the frontlines whenever you get a chance.